On Oct. 16, there was a cholera breakout on the University of Oregon campus, and no information on the contamination source. Fortunately, it was a mock crisis – and assistant professor Chris Bone’s Geography 181 students were on the case. Bone teaches everyday geospatial technologies such as global positioning systems and mobile phones with location-based tracking, and how they affect our lives and society. 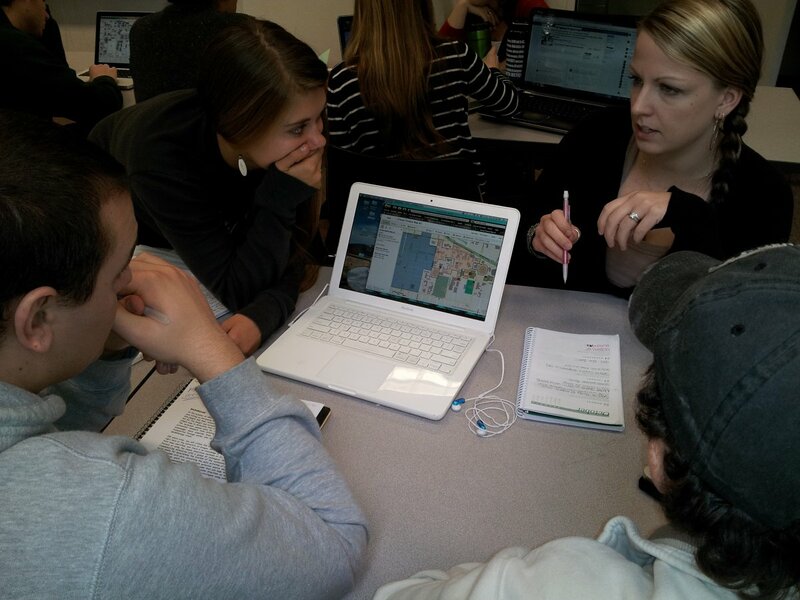 Last fall, the geography department introduced a new course: "Our Digital Earth," which is offered once in the fall and once in the spring, focuses on how online mapping and social media shape society. From Google Earth to Facebook to Twitter, the course covers how geospatial data are collected and used, how the technologies have transformed the way we make decisions and the societal issues that result. Topics include online mapping, satellite images, crowd-sourcing and mobile technologies for responding to natural disasters, galvanizing underrepresented communities and embedding spatial information into our daily activities. A high point for the course was the cholera exercise: Bone recreated the 1854 outbreak that killed more than 600 people in London, challenging students to use the latest technology to find the contamination source on campus. Bone’s students broke into small teams to use online mapping and social media to determine the location of the contamination. Students tracked the faux epidemic through medical reports and alerts arriving by email and Facebook posts, while monitoring mock tweets from the public for comments that might lend clues as to the contamination’s source. Some days students only received updates on the faux crisis through emails; on others, they received an onslaught of information in the form of Facebook posts, tweets and alerts. Most groups were able to determine the source of the cholera outbreak – a water fountain in Straub Hall – after at least 10 days. The team narrowed the outbreak location down to one of two spots, one of which was the correct location. “Like most other groups, the Landeros team was cautious not to provide their answer too quickly as the students were made aware that a wrong decision could lead to further new cases of cholera,” Bone said. In the course, Bone explains how real-time mapping technology is used by “riot managers” to keep unruly crowds one step ahead of police officers. Students also learn how to identify urban “food deserts” where low-income families have minimal access to affordable yet nutritional food. There is an increasing demand in the job market for individuals who possess both geospatial skills such as web-based mapping and social media skills and knowledge.